One of the most significant developments in digital photography has been the introduction of mirrorless interchangeable lens cameras. 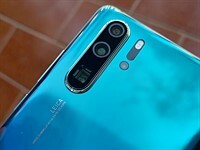 By removing the mirror and optical viewfinder, manufacturers are able to make their cameras smaller, without compromising ergonomics, performance and, in most cases, image quality. Composing photos on a mirrorless camera is different from a DSLR in that you use the camera's LCD (or electronic viewfinder, if the camera offers it). Instead of using a traditional phase detection system like a DSLR, mirrorless cameras use their imaging sensors to handle focusing. Focusing speeds on the latest cameras often meet or exceed those of DSLRs. Since the range in pricing is so great, we believe there are two groups of people who may be considering cameras in this class. One group wants a more compact, secondary camera in addition to their DSLR, but want more direct control than less expensive mirrorless models offer. The other is the photographer for whom this will be their only camera - someone who wants DSLR image quality and control without the additional size or weight. On the following pages you'll get a quick summary of each camera, and what we liked (or didn't like) about them). 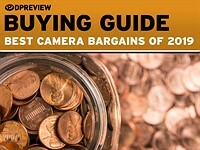 9 Which camera should I buy? Not entirely true. The EVF in the A6000 has some advantages - but the resolution is lower and this is very obvious. Especially a problem if you use manual focus and old lenses. What bothers me about the A6000, is not the lack of system lenses, I'm sure they will fill out, but that Sony don't have a dedicated mount for APSC any more, not so bad as you can fit FE lenses, What this means is there won't be a range of compact APSC lenses, like with Nikons DSLR's some OK kit Zooms and bulky and expensive primes and pro glass designed for FE. Sony pulling away by five lengths! Fujifilm trying to catch up in second place. Olympus and Panasonic neck and neck fighting it out for third place 10 lengths behind! Over at the far end... nearing the halfway marker... is a tiring Nikon! And Canon has just tumbled and crashed into a cloud of dust and smashed shrapnel! Pentax and Samsung has not left the gate! Hasselblad stables are on fire! A write off indeed! Yeah it has the most vignetting, distortion and sharpness drop in the corners of any lens in it's class. It has the most of everything so it's tha best! Which of these cameras do you recommend for occasionally live concert shootings? Now i have Fuji x10. They nearly kicked me out of the lotto arena when i was shooting a camera in this class. I would say the LX100. While it does;t have a long zoom, it has a really good low light lens. I have a goof Panasonic HD camcorder for videos thanks. I just want to know is this the best bang for my buck right now? A5100 has the same screen resolution as the A6000 and the other major difference between the two (other than body style and touch screen vs EVF) is the better video capabilities of the A5100. Noobie here. Looking at my first real camera. Save $469.98 when you buy this discounted package. Package includes compact system camera with included 16–50mm retractable lens for capturing crisp, detailed photos and video, extra 55–210mm lens with a wide, versatile zoom range, free 16GB memory card and free case with shoulder strap, after package savings. Plus free shipping. is this a good camera for sports like softball and cheer? this looks to be a good price? The camera is good, many PD AF points for tracking moving subjects. But bundles are, with few exceptions, never good deals for consumers. The included memory cards, batteries, bags, etc. are very rarely worth the extra money. I would recommend you buy the camera with kit lens($500 most retailers) or in a two lens kit(currently $600 on amazon) first and then shop for a cheap bag and a good memory card at a local store. Actually, the USD500 price is for the a5100, NOT for the a6000. The (good) price with extra zoom lenses is around USD750 for the a6000. I don't know the 55-210mm lenses that come in this kit, but with 11FPS and continuous AF, this camera is excellent for sports (specially considering the price!). Search the Camera Labs site for the a6000 review: they shoot a bicycle race at 10 fps and when they crop the racer's face, you can actually see snot or sweat coming out of his nose, so sharp is the crop! As far as Sony A6000, Canon needs to hire some of their engineers/designers for more features, AF, while Sony needs to hire some Canon engineers/designers for lens, especially good optic cheaper lens !! A6000 looking for good cheap lens !! Right, but I think it happened vice versa, the Canon developers escaped to Sony and Fuji. :-)) Technological difference between Sony and Canon increased apparently this year. These different designations DPR is using make virtually no sense, nor are they consistent with one another. The only reason I can come up with for all these different categories is to sell cameras in different classes, where owners of cameras in said classes won't feel slighted. This is just a very competitive market. hard to pick one over the other. The recommended Sony A6000 probably has the best value/features of the bunch. But it's kit-lens doesn't live up to the same standards. 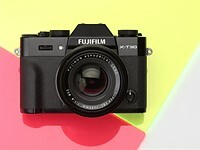 The Fujifilm has the best image quality with it's amazing kit-lens. But the video that comes out of it is garbage. The em10 and gx7 are great camera's with great lens systems but lag behind in the high ISO department. All of these will deliver in their own way. A disadvantage of em10 and gx7 is the smaller sensor so they have (given the same technology) a worse high iso performance. An advantage of the em10 and gx7 is the smaller sensor! So the whole sistem is smaller, both body and lenses. DPR, would have been nice if the 2014 version of this article had a fresh comments section. EVF vs touchscreen, plus hotshoe or not too... I've never understood why none of the NEX-6 (and now the Alpha 6000) had a touchscreen when lower end models did tho, some people want a touchscreen AND an EVF. That would've been too obvious considering the state of these 2 systems. The Sony a6000 is currently the best camera for the money ON THE PLANET!!! No other camera offers the quality and features for that low of price. AND...it competes with the professional level DSLRs very nicely. My 750 euro X-E1 + 18-55mm and 50-230mm kit respectfully disagrees. Sure it doesn't have the raw speed or specs of the Sony. But the image quality and colours are amazing and the manual controls make the camera great fun to shoot. I never want to go back to PASM. Fuji's kit lens is wonderful, and I lust after their primes. Neither camera is best - they're just different. With Black Friday, there are lots of deals. Just saw the Nikon D3300 with 18-55mm lens and Lightroom 5 for $380. The Nikon D5200 plus 18-140 lens for $800 or the Canon 70D plus lens for the same price. I agree. There are a lot of really good deals on very capable cameras right now. The a6000 in mirrorless and the K3 in DSLRs are exceptional values. 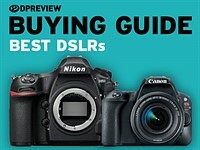 That D3300 with kit lens and LR5 for $380 is rediculously low too for a first DSLR. The gm5 doesn't have a pop up flash as said in the end. 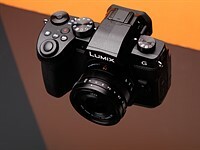 The Panasonic Lumix GM5 is an incredibly impressive camera. It won’t hold up to the a6000 or even E-M10 in terms of shooting experience. But considering its size, solid image quality, and the fact that it includes an EVF, pop-up flash and accessory hotshoe, all in a super tiny magnesium body, we have to tip our hat to it. You might wish to update the information on the Sony models since the standard price (as per Amazon) for the Sony a6000 with the kit lens is $698 as of this writing, while the a5100 is $498. That is a significant price difference between the two. It's not just that. We don't live all in USA and price may be very different. For example, while Sony a6000 is $498 in USA now due to temporary big discount, how much it is in EU? Here e-pl7 and e-m10 costs less than a6000, e-pl7 is some $300 cheaper, while e-m10 is $100 cheaper. Yeah the A6000 just has a very steep discount for Black Friday, but the price will surely go back up soon. They had originally discounted it only $100 but it's now a $200 discount IIRC. In the final comment it's also claimed to have a pop-up flash, whilst the picture clearly shows the clip-on unit. These round-up articles are probably rushed out for the shopping season? So you`re suggesting that DPR can`t tell the difference between a GX7 and a bright red GM5 - LOL ....... well you never know . The size difference is kinda obvious. Not that the Gx7 is a large camera but the Gm-5 is just tiny. Is it better then the 5100?? The a6000 and a5100 use the same sensor. Something I don't get: why this round-up review of the E-PL7 is dated November 24th 2013 when this camera was only announced in August 2014? Please make your reviews more consistent. For example in E-PL7 review you mentioned two contradictory statements. "Controls feel like that of a compact, not a mirrorless camera"
I'm using this camera and it's controls feels same or better than dSLR with one control wheel. Your statement regarding controls which feel like that of a compact can be applied only if you use default settings and don't bother to customize it, but then many cameras have some crappy default settings. What I as photographer consider cons are those things which are not good and which I can't change (like for example not good JPG engine, not good viewfinder...), not those things which are not good by default but is possible to change. I think they've copied and pasted that from the GX7 bit, but it's wrong. Gx7 has 2 stops IBIS in my experience. to 3-4,5 stops depending on which olympus model. Go straight to the roundup. this landing page serves no purpose at all. When you evaluate a camera for gold awards and such, it makes sense to evaluate the body in isolation. 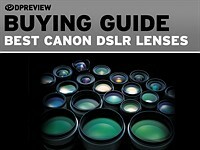 But when you make a purchase recommendation for a system camera, shouldn't you also look at the available selection of lenses? Martin Parr uses Nikon with ring flash with macro lens, but I'm sure that his color is not accurate. So you may want to avoid Nikon. LOL. The camera itself is not that important as a good macro lens and lighting. I'm a dental lab tech/owner doing a lot of chairside assistance. I personally use my old Canon 20D with Canon 100mm f2.8 macro lens and Sigma EM-140 ring flash. Even though the camera is pretty old, the lens and the flash are excellent, the entire set looks very professional and is doing the job just fine. Due to shade matching, I wouldn't recommend using any digital camera at all for that, because too many factors will affect the shade accuracy, such as white balance settings, mixed lighting conditions, viewing display calibration, etc. Fuji X-E2 worth to get 1? It's strange the summary of the OLY E-M5 doesn't mention pretty crappy video implementation & quality as one of it's weaknesses and doesn't praise the Pana G6 for it's outstanding video implementation & quality. I have both the Pana G6 and GH3 and it's near impossible to see any difference between their out-of-camera video ouputs, but the GH3 has numerous and higher codec choices. To the advantage G6, it has 1080/60 in ETC mode (GH3 only has 1080/30), which is very important to a nature shooter like me. Perhaps I prattle too much of video on a mostly-stills-info-centric crowd. 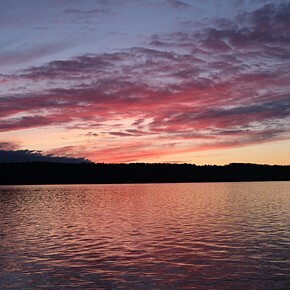 Does Sony NEX 5T captures sweep panorama held only horizontally as the NEX C3? 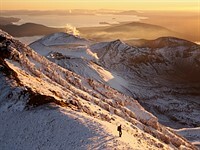 I read somewhere that some newer NEX models can capture panoramas held vertically. I searched for this info online but can't find clear description. 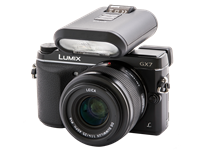 I've had my Panasonic GX7 now for about 1 month. I really enjoy shooting with this camera. My main lens is the pancake 12-32mm. At some point I'll buy the adapter to use my Leica R lenses. Great Camera! I'm surprised that you've put the E-M5 here instead of the E-M10 given your review of the E-M10. Any particular reason why the E-M10 was left out in favor of the E-M5? 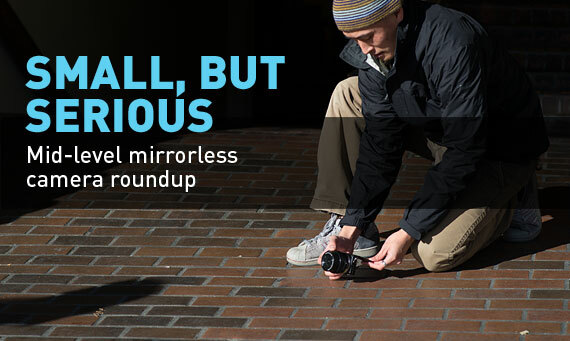 We haven't updated this roundup, yet, so the E-M10 hasn't been covered. It will be, though. Most of M43 cameras have In-body image stabilization, but noon for all APS-C cameras. Therefore M43 cameras have better/wider/cheaper lens selections. APS-C sensor is 150% larger than M43 which should have better IQ if both have same MP count and same generation/technology. it always puzzles me that why Sony/Fuji do not introduce In-body image stabilization for their APS-C mirrorless camera. Why? Why M4/3 is pushed, over an APS-C is beyond me. That's like preferring a VW over a BMW. More like VW vs Audi. BMW would be 135 fullframe. Are you saying an APS-C is fickle and requires far more maintenance cost and tuning requirements then a 4/3's? Not in the slightest. In theory aps-c should be superior to micro four thirds in every way except weight. To my surprise the comparison photos show otherwise. The only conclusion I can reach is that the manufacturers of aps-c equipment treat it as an unwanted but necessary evil. They are perhaps just producing them to get you hooked on their line of equipment hoping you will eventually move up to pricier equipment. MFT manufacturers don't have that option and are producing the best equipment technology allows within the constraints of the sensor size. does that mean the bmw like 135 full frame would be plagued with electrical problems? One HUGE problem I have with M4/3 is not image quality, but its deep depth of field due to the small sensor size at equivalent focal lengths. As for camera size and weight, well, my Fujifilm XT-1 is not that much bigger than the Olympus E-M5. And the Sony A7 is very small, considering that it has an FF sensor, and I'm not a Sony fan. So if you are talking about advancing technology, yes, it has advanced so much that M4/3 now produce great results, but technology has also advanced so much that a camera with an FF sensor CAN be as small as M4/3 cameras. 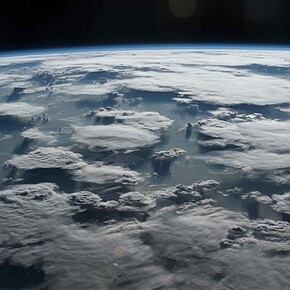 But technology has not been able to make images made by M4/3 sensors to have the same shallow depth of field when compared to its bigger sized cousins at the same equivalent focal length. Tech is certainly improving and APS-C can fit in much smaller bodies. What APS-C and FF can't do is get their lenses down to size. That's obviously a constraint by sensor size which probably won't change ever (or at least not in any near future). 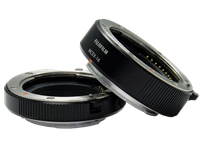 Lens diameter has no option but to cover the entire sensor to make full use of it. As far as DOF, I've seen M4/3 shots with extremely shallow depth. But I suppose everything is relative. To me, the size tradeoff is worth it. I think the a6000 is awesome. Great price, performance, ergonomics and quality. Have you seen the Canon EF-M lenses particularly the 22f/2 pancake, the EF-S 24f/2.8 pancake or the EF 40f2.8 pancake? Can we have a full review of the Panasonic DMC-G6 please? And the H-FS14140 14-140mm lens? Ineresting here that the title of the article is about G6 review and I don't see something like this. Article have few informations like comon anounce about G6 And the comments is all the world around about but not G6. 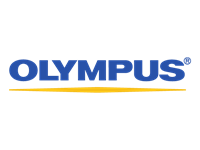 It is a Olimpus fan group. About Fujifilm vs. Olimpus. Something about Canon Eos M and many others including Sony NEX and Samsung NX but nothing about G6. Is a big disappointment becose I come here to find something new, interesting or triks about G6 and I read with much ptience all 205 comments for nothing. Agreed, i had also clicked on something like "G6 review" and there is nothing like it here. I don't demand a full review of every camera, but i think it would be nice to have an honest description of this descriptive text - "review" certainly is not the correct word. I understant that "review" brings in readers through Google searches. I wonder if would be disappointed when seeing what is posted as a review here. Could you let me know where you found a link marked 'Review' that brought you here? We don't want anyone to feel misled, so will try to correct the wording, if we can. I have to agree that it was misleading (not a big deal; I will search for the actual review which I'm sure is on the site). 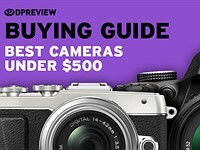 I clicked the DMC-G6 "Read review" link on this page -- http://www.dpreview.com/products/panasonic/cameras?subcategoryId=cameras -- and got here. It is indeed totally misleading. Correcting this will require re-programming some of the back-end of the site, so will have to wait until the developers have finished their current projects. The problem is one of finding and updating all the bits of the site that haven't kept up with the expansion of the types of content we produce. I apologise if you've felt misled in the meantime. Wish it were weather-sealed! First advanced, weather-sealed APC mirrorless that also has a weather-sealed, ultra-wide zoom get my vote in dollars! Ziploc and a couple of rubber bands. Done. What do you think about the Fuji X-M1 vs the Samsung NX300? Samsung is much cheaper and more importantly samsung lenses are much cheaper also. To: Pluent Thanks for your comments. I gave up on DSLR's & have been using Point & Shoot's like Fuji F-31fd, Lumix ZS7 & LX5 for compact sizes. LX5 is good w/ low-light shots but has 3.5 x zoom, luckily ZS7's 12X zoom compensates LX5's insufficiency. Their limitations mostly due to small sensors, especially when taking pictures inside grand churches, palaces & hotels, also focus-speed is too slow. 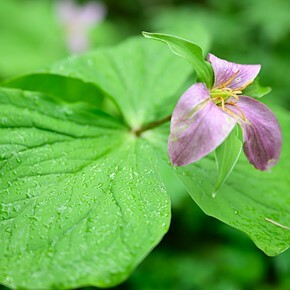 With the kind of pics I take, Fuji-Zuiko's 18-55 or Olympus' 12-50 (Or 12-60) will suit me just fine & I use just one lens. Sony still sells M4/3's but Full-frame sensor & small body is their next target. So should I buy Fuji or Oly? Tks. GSC, such a tough decision, and were money not a great factor in the decision, I would have an even harder time at it. From other forum feeds and reviews, I would say go with the Fuji as it will probably give better low-light performance, and a little better image quality if you are going to "pixel-peep." However, I say that hesitantly, as good image quality, and preferences for image appearance differ. If you shoot JPEG only, Fuji won't look exactly like Olympus JPEGS, their colors are a little different when processed on board, and honestly both Fuji and Olympus are both well known for how good their JPEG images look. The comparison qould be more difficult were you to compare the Fuji XE2 with the Olympus EM1 which has better ISO performance than does the EM5. I looked at the pictures you linked with your reply, and haven't seen any close up/portrait style shots; seeing performances and street shots where lighting can vary greatly. The nice thing about the XE2 is that it has both contrast and phase detection for its focusing drive, that said if it works as Fuji claims, it should outperform the EM5 in focus speeds with both still and moving shots, I haven't read anything confirming this in a real world setting, however. So, yes, got with the Fuji, unless you plan on getting wet or playing in the sand. The crop factor of the Fuji XE2 is about 1.5 vs the 2 of the Olympus, so the wider angle will be more easily obtained from the Fuji kit lens over the Olympus kit lens- but the depth of field will be a little different between the two, not likely to matter too much with street and wide stage shots as far as I understand. Hope this helps, again, I say it with some hesitation, they are both great cameras! GSC, even though I suggested to go with the XE2, please don't just take my word for it, I really don't feel like I know your preferences well enough, and am guru enough to do more than suggest. Good luck! Pluent, Thanks for your comments again. 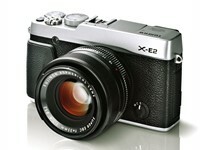 On Specification alone it seems to be better than the Oly EM5 and Fuji XE2. How do you like it? Would appreciate if you don't mind to comment again. Tks. Please kindly help me to decide if I should buy the Olympus E-M5 or the FujiFilm X-E2? 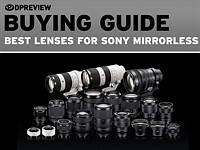 Lens Upgrade: Oly: To Zuiko pro-series: 12-60 ($990) (Zuiko kit lens 12-50: $550) Is it worth to spend an addition of $500 on 12-60 lens? One major concern: Will the more bulky sized 12-60 lens cause any shadowing problems when flash light is being used? One side-question: Rumours said Sony has already given up on developing Micro-four third cameras but totally concentrates on full-frame models like the A-7...is it still a smart idea to buy a 3/4 mirrorless camera at this time? Two things before I get to my response; firstly I am not sure of for what purpose you will be using the camera predominantly, and secondly I am not sure what you meant by mentioning that Sony may have discontinued it's4/3 line up. I am by no means a professional, but having been interested in both of these cameras I have learned a little. You mentioned video, and yes, from what I have read, it seems Fuji is not such a video provider but it is great with still shots. 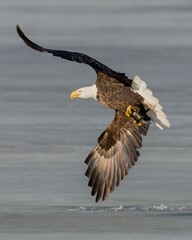 The EM5 has 5-axis in body stabilization (IBIS) and is better equipped for video than the XE2, however, it isn't perfect, and would recommend you check out these cameras reviews at stevehuffphoto.com as he reviews both and has a separate review of the 12-50 lens kit of which you were questioning. The Fuji X-Trans sensor is an oddity, in that it differs from Bayer type sensors that can cost slight IQ (image quality) as the Bayer requires a low-bypass filter (or often does). 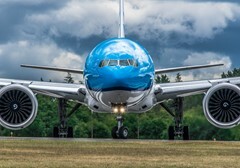 However, as the sensor is odd in that it is proprietary, RAW processing with some software suites can be potentially harder with updates becoming available later on. That said, I hadn't heard until this post that landscape shooting was inadvisable for this system.... Interesting, will have to look into that. Thw X-Trans is supposed to offer higher sound to noise, and as it is larger than the 4/3 sensor, higher ISO should be a given. This goes back to the background of your decision - if you want to shoot wide angle shots the 4/3 system has a crop factor of 2, unlike the X-Trans which shot per shot provides a wider angle which is good or bad depending on your preferences and purpose. Do you wish to shoot in inclement weather, on the beach, desert? 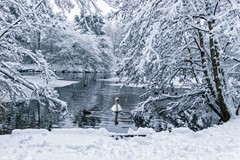 If so, consider the EM5 as it is weather sealed, but beware the lens you get for it, for most micro four thirds lenses are weather sealed. The 12-50 is, though it is "slow" in that it's max aperture is f:3.5 and it has been said that it gets softer at wider f stops, you pointed out it is at higher focal lengths too- didn't know that, good to know as I will probably get an EM5 this year. 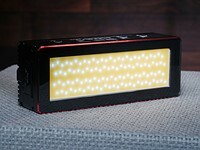 The 12-40 is "brighter" in that it opens to f:2.8, and has very good reviews. The killer is the price, the 12-50 costs about $200 (US) used on amazon (still cheaper to buy with body as opposed to post purchase), but the 12-40 is nearly a thousand US dollars. There are at least two Olympus 4/3 lenses (not micro 4/3) that are weather sealed, and are brighter than the kit 12-50,however there is a catch in that it seems the 4/3 lenses focus slowly on the micro four thirds system, (if you go this route the 14-54 f:2.8-3.5 II AF is the best I have found, and can be purchased additionally with an adapter for less than $650 US , though make sure you get the Oly MMF-3 4/3 to micro 4/3 as it will maintain weather sealing between lens and camera (not all adapters do this). The Fuji lenses seem to be good pieces of glass, especially the 35 f/1.4,but again can't provide any recommendations as I don't know your background. Lastly, if you care about where your camera is made, likely the Fuji is made in Japan, and the Olympus probably in China. I like both of these systems, but as I have already invested in the m4/3 system, I have to lean that direction. The lenses available for the m4/3 system trump most if not all other systems, there are some Voigtlander primes with max apertures of f/. 95! Of course this is a good thing to create creamy bokeh with a smaller sensor, but the options are good for the m4/3, and IBIS means adding old 35mm lenses will still be sharp at longer focal lengths. WCHAY was right about the wider angle of kit lens being available for the Olympus, not sure why I forgot the kit lens for the Olympus was a 12-50mm. As for the Samsung NX30, I couldn't be too sure what to say even less so than the comparison between the Fuji and the Olympus, as I couldn't bring up the price of the Samsung, and there are still things in Beta about it, it would be hard to say until it actually hits the market. From what I have read on it, it has a lot of nice features, making it quite competitive with the XE2 and EM5, tough decision. One other thing, I believe you mention an Olympus 12-60 which I cannot seem to find in the micro four thirds set, only in the four thirds setup. Your last post (sorry I didn't reply directly to it, there was no "reply" button), mentioned you do more types of shooting. If you shoot children or sports I would steer you back to the Olympus as there have been a lot of complaints about autofocus speed on the Fuji for fast moving subjects. With that note, there is a catch, and that is that the EM5 doesn't have phase detection so it won't track moving targets very well. The Fuji does have phase detection, but haven't heard that it's autofocus bests that of the EM5 as yet. Maybe with more firmware. Most mirrorless cameras won't take sports/action shots too well like a DSLR. I have heard good things about the Olympus EM1. If you are set on sticking with one kit lens, and shoot with flash, and shoot children or fast moving subjects, I would suggest getting the EM5 body, and separately the 12-40mm as it is worth the money in my opinion, as it is sharper and has a wider aperture which you will need with a 4/3 sensor. If you rarely shoot fast moving subjects, and don't play in the rain and dust, go with the Fuji as I think it's image quality will be better. Of course if you want to wait until the Samsung comes out, these recommendations may be less pertinent. For some reason my last reply was missing part of it's text. Anyways, the 12-40 is recommended if you get the EM5 as a body. Also, when I say that the Panasonic 20mm 1.7 struggled with no flash, I meant with solely incandescent artificial light, and/or low natural light. 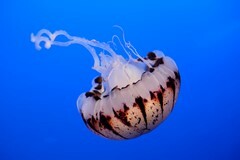 Otherwise, if your room is well lit with good bulbs or sunlight, the 12-40 may be adequate as the Panasonic 20 1.7 was. As far as I am concerned I believe only micro-four thirds offers a full lense range (say 14 to 600 mm) in full frames 35mm terms. If buying into a camera system that would restrict my choice to the two panys and the olympus. what camera should I choose if I will 75% of the time be using it for events both inside and outside(day & night)? I use my iphone right now, not because of the quality or photos or videos, but because the sound is better than any point and shoot I've had in the past. I am now on the hunt for a nice 4/3 that will have great sound and DSLR quality to it's photos and videos. I need some straight advice, please: GX7 or XE2? Background: I used to shoot with my Leica M6. 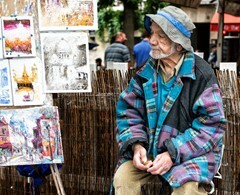 I do mostly street photography. I love my GF1, but am ready to upgrade. Two issues: I do not like the way the light meter reads in GF1 (or I use it wrong), why not a match like the old days (needle, diodes)? I don't know if the exposure is correct until I press the shutter? Again, this could be me. The XE2 has a shutter dial on the camera, but how does this affect reading the light meter inside the viewfinder? THIS IS A BIG ISSUE. So, GX7 or XE2? I am not too concerned with video or wifi or whatever, just good images. Does the fuji processor trump the 4/3? 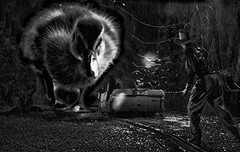 I sometimes enlarge to 20X24. My old Leica (and Canon FTb), I have prints 4' X 6'! Both are awesome (not really planning more, I used to print at a lab). Unfortunately I cannot find a store that carries both for me to look at (or even one of them, where I live). Oooops, I meant does the Fuji sensor (not processor) trump the 4/3? Have you tried the studio test scene link on the particular camera pages? My favorite there are the color circles right to the bottles. There are corner cases like red/blue color combinations leading to strange lila (red+blue) borders. This green plants also show some resolution issues. Somehow the X-E2 lens seems to be soft or not correctly focused (vs. sharper images with the X-A1). Somehow I don't get some of your points, you claim that the fuji x-e2 is lagging behind in the autofocus department, but don't have a review of it yet. After years lugging a dslr around, and now a MiLC I believe they are becoming a great alternative to a dslr with no loss of quality. Guess next time you'll have to have a high end mirrorless camera round up. If this is a good camera, then what is a bad camera? The images from this camera are some of the softest that I have ever seen. The way to evaluate image sharpness is to look at the details in a landscape image, and all of the landscape sample images in this review are a blur. It astonishes me that DPR continues to give high marks to cameras that produce such bad images. Do the reviewers have eyes??? "Oh, it's an expensive camera from a high-end manufacturer, so it must have good image quality." What a joke. NEX 6 is so underrated. 1 stop advantage over any M4/3, and better DR in the shadow region. because we are in m43 land here..
What a skin-deep comparison test by famous DPR. Even the Chinese websites dc.pconline.com.cn has done a much better & more complete review in their latest mid-level DSLM comparison test. While I respect your decision to steer your purchases in the direction of your political conscience, increasingly corporations are global in terms of capital investment and ultimately who benefits from their success(es). And, while China's practices tend toward more insularity (therefore banning them may be a more appropriate targeting than other companies), unfortunately ethical behavior is worsening as globalism allows for increasing corporate obfuscation across the board. That would be all the more reason to be "brainy-rational". Or would you just suggest going off half-cocked, perhaps as the US did in Iraq? I think it's time to include the country of origin with the cam. It is a significant part of my buying decision. It is about the expected quality and it is also about my political preference. Instead of just complaining about Chinese policies, say, I would rather not buy Chinese right now. Most Panasonic cameras are made in Japan. At least both my GX1 and GX7 are made in Japan. What about the processor, lens, memory, sensor? or raw material origin? The truth is that even if the camera is manufactured in China, it only contributes to probably negligible of total cost. Additionally, these jobs provide many low skilled jobs which directly benefit the poor migrant class in China, and not the government. While it might seem the right thing to do, you might want to ask yourself why? i.e. are you not just try to find a scapegoat in China? No offense but I find some Americans especially ignorant and self-righteous. Perhaps it's the American media that's almost always heavily biased... It's always easier to blame a foreign country and not interest groups within your own country. Not suggesting that you should stop your grand mission to "send China a message", but if you wanted to express yourself, perhaps you should start closer to home. i.e. boycotting companies based on their tax evasion or outsourcing policies.